Months ago an advertisement was placed in the Excelsior News by Eskom that Piet Retief’s electricity will be cut because the Mkhondo Local Municipality was at fault for not paying their account timeously. MLM managed to pay a minimum amount but defaulted some of the next payments on the payment schedule arranged by Eskom. The next thing was the transformer that played up and loadshedding was installed again, to try and relieve the situation. At last a transformer was obtained from Ermelo. It was business as usual again or so we thought. Ideal selling points were removed from businesses that sold electricity because of a decision made by MLM. These meters were not replaced with others. The company that installed the meters didn’t pay across monies due to the municipality. Many people stood in line that were not guilty of having arrear accounts This has been ongoing for more than 2 years now and the municipality pulled the plug on that. On an ice-cold Saturday afternoon, 13 October 2018, the Mkhondo Local Municipality decided to cut the electricity supply to some wards in Piet Retief. 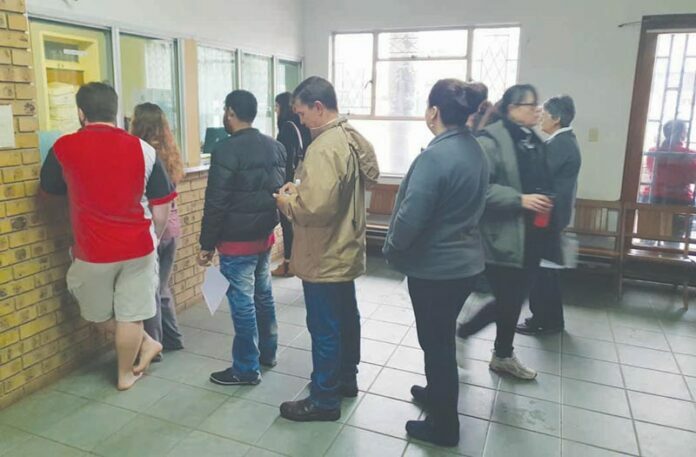 The citizens of Piet Retief had to go to the municipal offices and stand in line to get a printout of their municipal accounts. No warning of this was published and by word of mouth only, people went in their hundreds to the office. According to the electricians this was decided by the Mayor. He wanted people to visit the municipal office with proof of payment and at the same time encourage each other to do the same. This is outrageous! The municipality has record of each and every person and knows who paid or whose accounts are in arrears. It is unfair to expect law-abiding citizens, who pay their accounts timeously, to go and verify the situation. Maybe the account system is not up to standard and they themselves do not know. Maybe the transformer could not handle the demand on Saturday and this was the only stalling tactic to relieve the transformer for a while. If an account is behind, cut the electricity of that particular household or business. Do not penalise all the people. It is unfair and uncalled for. Is this even legal? The Eskom account has to be paid again in October, like it was stated in the Excelsior News of 12 October 2018. Information of the amount that was paid by people on Saturday is awaited from the Mkhondo Local Municipality and will be published as soon as we received it. Many councillors could not be reached on Saturday.